AFTER weeks of frenzied speculation, some members of the military have finally been exposed for allegedly looting goods donated to survivors of the recent Cyclone Idai which left a trail of destruction in the country, mainly in Manicaland Province. The tropical cyclone killed 364 people and displaced thousands others in Chimanimani and Chipinge districts. Last week, police said it had launched an operation to bring to book people who were looting the aid. This followed consistent allegations that some rogue soldiers and police officers had also been fingered in the shameful looting of the aid, which the government had received from several local and international organisations. Embarrassingly, a police officer was among the people who were arrested two weeks ago after authorities launched a special recovery operation in Chimanimani and Chipinge – the two districts that were hardest hit by Cyclone Idai. Yesterday, it emerged that police had arrested Zimbabwe National Army and Air Force of Zimbabwe officers on allegations of stealing goods donated in Chipinge. The arrested military officers are wallowing in prison after Chipinge Magistrates' Courts denied them bail. Talkmore Collins Mavudzi, 35, Anymore Matata, 41, and Admire Munonyara, 32, have now approached the High Court seeking bail. Their lawyer Simon Chabuka is contesting magistrate Farai Gwitima's ruling which said they would interfere with witnesses if they were granted bail. "While it is true that there may be no evidence at the moment to suggest that the accused persons attempted to interfere with witnesses it cannot be ruled out that chances of interference are very high considering their positions. "The admissions of the accused persons to bail will jeopardise the interests of justice and they are denied bail," Gwatima ruled. Chabuka said his clients were still presumed innocent until proven guilty of the theft charges by a competent court. "The penal provisions of the offence that they stand charged for provides for a fine as an alternative. "This fact shows that the offence is not serious at all… the value involved is not so much that it induces a sense of shock and at this stage…are still presumed innocent," Chabuka said. The matter will be determined by Justice Sylvia Chirawu-Mugomba. 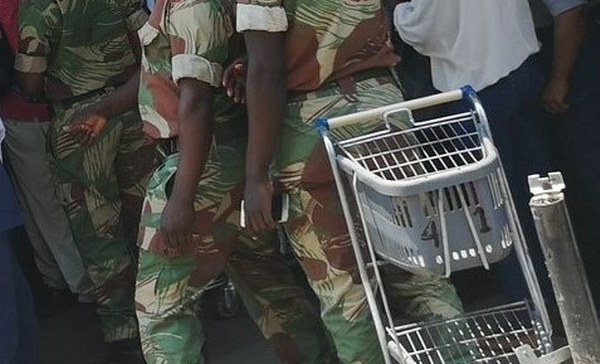 According to court records Mavudzi, Matata and Munonyara who are members of the Zimbabwe National Army and Air force of Zimbabwe, respectively, were deployed at Silverstream Distribution Centre to assist Cyclone Idai victims. The court heard that on April 1, the trio approached Joseph Mtetwa at Silver Streams, Wattle Company Estate Chipinge and asked him to keep their property at his house. Part of the property included 25 boxes of cooking oil, five blankets, 50 litres of diesel, four kilogrammes of washing powder, donated clothes and shoes. Mavudzi and his alleged accomplices had been instructed to ensure fair distribution of the goods. It was alleged that Panganai Simango and Macdonald Jumburu arrived at Silverstream and were asked to collect the goods from Mtetwa's house and deliver to a driver whose further particulars are not yet established. When Simango and Jumburu arrived at Jopa turn, police who were manning the road block intercepted their car as they had been tipped that the duo was transporting looted goods. A search was conducted and the loot was recovered with the duo further indicating that they had left five more boxes of cooking oil at Mtetwa's house. Police proceeded to Mtetwa's residence and recovered the cooking oil boxes. Mtetwa implicated Mavudzi, Matata and Munonyara. Mtetwa has also since been arrested.